Out of all the rooms in the average home, the bathroom will probably be the smallest. For this reason, careful planning is needed to make the most of the limited space available in a tiny bathroom. There is no reason why a small bathroom cannot have all the necessary furniture and items compared to a larger one. By using some clever tips and tricks, you can use areas of your bathroom that you would never have thought of and really maximize all available space. Also by using specially designed furniture, designed for small spaces (especially small bathrooms), you can get the benefits of furniture that is multi purpose or designed to fit in areas that regular shaped furniture would never fit. 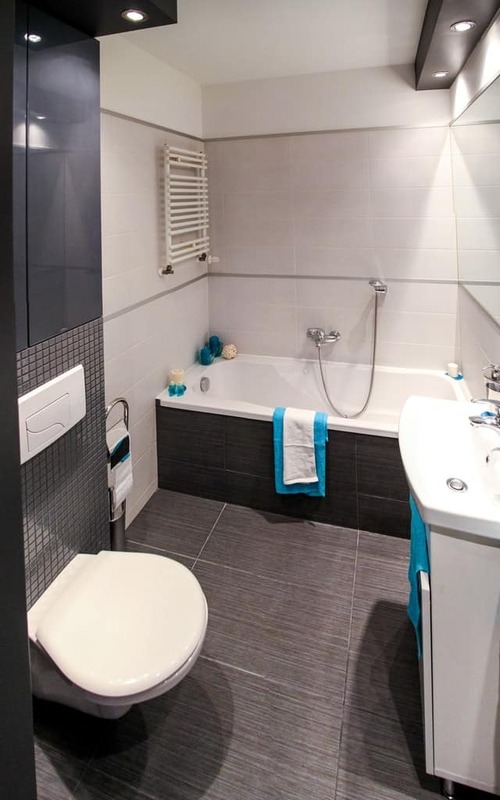 In this article, How To Maximize Space In A Small Bathroom, we will be showing you some of these tips and tricks and also showing you some of these special types of furniture. By reading this article, we hope you will be able to make the best use of the limited space you have in your bathroom and also make it feel a lot larger than it actually is. Just because you have a small bathroom doesn’t mean you need a small mirror. Most people will automatically look for small furniture for their small bathroom because they don’t have the space for large furniture right? Well, not all furniture is the same. A large mirror will actually give the illusion of depth in a small room. Also, the more light that hits the mirror, the more light will reflect into the bathroom, making it feel brighter and more spacious. By using taller furniture and accessories from the floor all the way up to the ceiling, you give the appearance of a taller, bigger room. For example, using a cabinet that is both narrow and tall will take up little space on the ground, however will take your line of sight upwards. Another example, is to hang your shower curtain as near to the ceiling as possible. Once again this will draw your eyesight upwards, maximizing the feel of a taller bathroom. When painting the walls or adding bathroom tiles to the floor or walls, make sure you choose a light color. A pale, soft color will make a small space feel light and airy. In contrast, a deeper color will make a larger area feel smaller and cozier. Adding multiple shelves to your walls can really make the best use of available space in a small bathroom. By adding shelves to upper walls, you will be making use of space higher up rather than lower down. 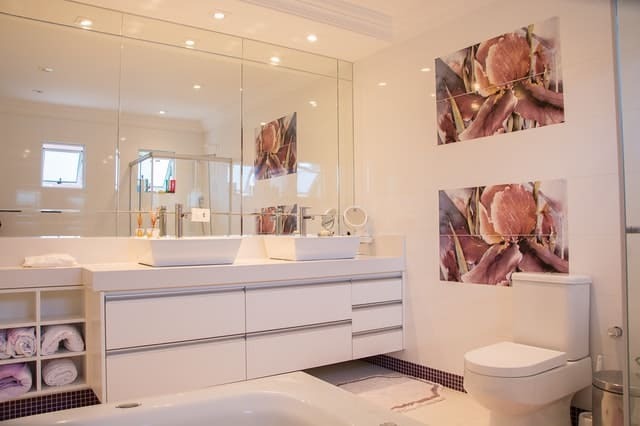 A bathroom that is filled with items on the ground will have a claustrophobic and cluttered feeling, however by using free space above the ground you will be freeing up space on the ground and making the room feel more free and airy. The previous tip leads us onto this specific tip. How about setting up a shelf above the door frame. This space is rarely used and can be a wonderful place to set up a shelf for rolled up towels, cleaning products or even plants. Multi-purpose furniture gives you the benefit of two or more pieces of furniture all rolled into one. The best example of a multi-purpose piece of bathroom furniture is a bathroom cabinet that also has a mirror. Why have a mirror and a cabinet separately, when you can have one together. Adding a glass panel to your shower can open up your small bathroom and make it feel more spacious. 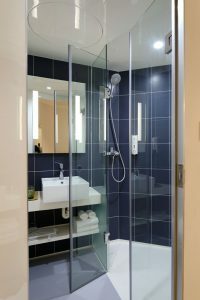 By replacing a shower curtain with a glass panel or door, it also allows more light to pass through and hit all areas of the bathroom. A frosted glass door or panel will give more privacy if needed and will still allow this light to pass through. A wall mounted cabinet or shelf is the easiest option, however they can take up a little more space than a recessed cabinet/shelf. By installing a recessed cabinet or shelf, it is possible to have a cabinet or several shelves without eating into any bathroom space. If your small bathroom is long and narrow, having tiles that are in the same direction of the bathroom, will add to that tunnel like feeling. However, having floor and shower tiles that are in a sideways direction / against the length will make the room feel wider. Due to the fact that the tiles are working against the length , it gives the illusion of stretching the room, making it appear wider than it actually is. A bathroom may be the smallest room in your home but it still can benefit from some of these tips to make it look and feel larger. 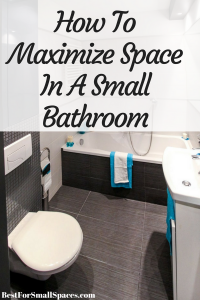 By following some of these tips on how to maximize space in small bathrooms, you too can make your tiny bathroom feel a lot more spacious.